In the goal settings menu, you can change all the wording associated with your goal. The goal name should be a short word or phrase that reflects the goal's intent. It's also used in the URL to your goal, so choose wisely! You can change this anytime, but Beeminder will not automatically create redirects -- if you've linked to it elsewhere, those links will be dead! To change the goal name, first type the current goal name in the popup to confirm you understand you'll break links. Then type the new name in the text field that appears and hit Enter or press Update Goal below to save the change. The goal description is an optional, slightly longer way to describe the goal's intent. It appears underneath the countdown on the goal page, as well as underneath the goal name in the dashboard. Most people use this to provide a little more info on goal context, for when the goal name doesn't convey quite enough info. To change the goal description, type the new one in the text field, or use the pencil icon below the countdown line above the graph image to do the same thing. Hit enter or press Update Goal to save the change. The goal units is an optional field that describes what you are counting with your goal. If you want to read more, it could be "pages" or "books" or "papers" - whatever you're counting to satisfy the goal criteria! You can change the units text anytime by editing the text field, then hit enter or press Update Goal to save the change. If you want to change the unit text and the value (e.g. from minutes to hours), scaling the goal is probably the route you want to take! For goals that measure hours, it can be helpful to see things in terms of hours and minutes: "47 minutes" rather than "0.7833333 hours." Tick this box to convert hours to HH:MM display. 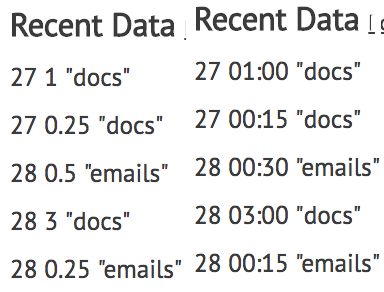 Note that if your goal is not using hours as its unit, this option might display really bizarre-looking information! The fine print is a free-form text field that lets you enter just about anything you want. Some people use it to keep a history of their goal and significant events. Others use it to list special exceptions or conditions, like "any derailment on this goal is not legit if my office called me after 9pm that night." Others use it as a rulebook to keep track of really complicated points systems. The fine print is private unless you want to make it public, by checking the Make fine print publicly visible box and saving changes.